Typically for trianglehike, I blog about hikes near the Raleigh-Durham-Chapel Hill area. However, my family so enjoyed hiking Crowders Mountain outside Charlotte, I thought I would briefly describe it here. Although the drive from the triangle would be about 2.5 hours, I certainly think it is worth it. 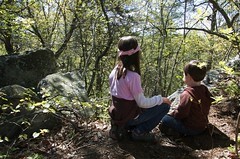 Directions to the park can be found on the ncparks web site for Crowders Mountain State Park. Here is a nice google map link to the park office for directions too. With around 20 miles of hiking trails, my family certainly could not do the park justice in one afternoon. I’ll describe our loop. 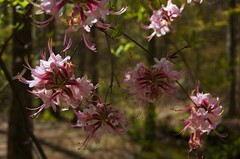 Hiking from the park office in either direction yields woodland trials up Crowders Mountain. The remainder of the trails trace the long ridge and the associated camping grounds and peaks. From the office, we chose the moderate Turnback trail up the mountain. In April several flowers were in bloom and the trail traces a lazy stream for a bit. This connects to a portion of the Pinnacle trail across the ridge and back down to our start. This loop yielded an approximate 3.5 mile hike. 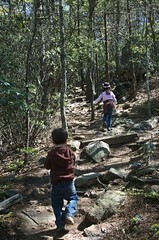 The Pinnacle trail is labelled as strenuous, but my three year old navigated the trail with minimal difficulty. Although boulders line the trails and are great bait for ankle twisting, no serious climbing or special equipment was required. In fact, we saw several families and their canine companions on the trails as well. The trails have obviously seen a lot of maintenance, and I suspect many hours of Boy Scout volunteer time have been spent there.